They enter their run-down house with an eye towards a less-complicated lifestyle and a desire, a necessity, really, to pinch pennies. In fact, not much happens to the couple, but Hong (both author and character) manages to demonstrate that the devil is in the details, and even the smallest lives can be epic. Winter seems endless and money is scarce. They regularly run into small problems that loom large in their isolated situation. The couple muddles through. It becomes clear that whatever problems Hong has, they are not related to geographical location; rather, they are located within him. Hong dreams of success, but procrastination, a form of self-loathing and a seemingly inexhaustible store of anger cripples his work. His wife, on the other hand, enjoys a notable bit of success, which eventually helps Hong to understand himself. And that is what the story is really about: Hong coming to understand himself and his marriage. Underneath all the plot details are the love and commitment that Hong and his wife keep for each other. This commitment ties the story together and gives it a universal and comprehensible theme that should make it interesting even to readers who may not catch all the cultural elements in the novel. And there are Korean cultural elements aplenty. 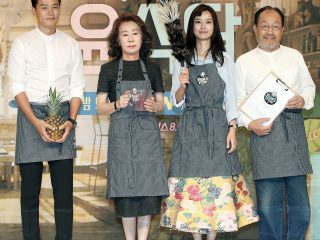 The focus on the importance of food to bonding, drinking culture and even fistfights with trees will bring a chuckle of recognition to those who have lived in Korea and open a window into the culture for those who haven’t. It is sometimes difficult to determine what is meant to be “real,” as Hong also includes long flashbacks, digressions and scenes of fantasy. The effort is worth it, however, for Hong’s clever takes on these aspects of Korean culture. The illustration is good, reminiscent of Lynda Barry in its simple depiction of people and Shigeru Mizuki in that landscapes and backgrounds mix realistic and impressionist elements in an extremely evocative way. As the back cover notes, the artwork “ranges from the gently pastoral to the surreal and harrowing.” There is also a touch of modernism in the narrative. When Hong attempts to concentrate, his head splits open to reveal the distractions lurking within; characters on the written page can climb out to badger and haunt Hong, and worries multiply so quickly that they physically overstuff the page. The translation, by Californian cartoonist Hellen Jo, is economical and easy to read. 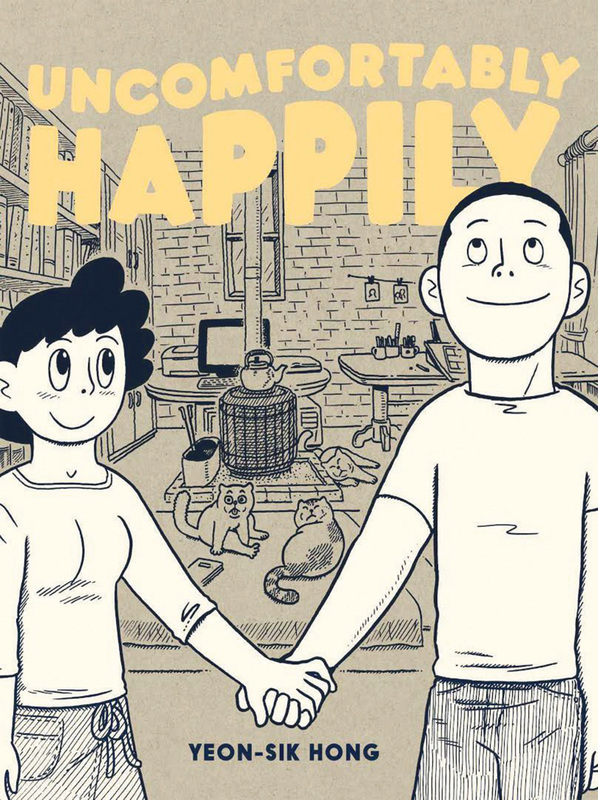 “Uncomfortably Happily” is several things at once: an ambitious and successful graphic novel; a work of literature; a commentary on Korean life; and the story of an ultimately successful marriage. It is published by Drawn & Quarterly and is available on their website and from the standard online book-sellers. “Uncomfortably Happily” is worth reading if you are interested in a wry family tale, Korean graphic novels, or an introduction a wide range of Korean modern culture.